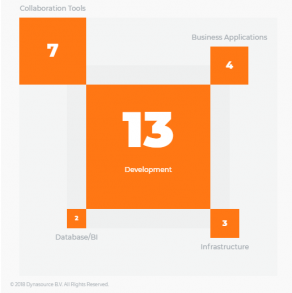 Dynasource launched in 2015 as a Microsoft channel business enablement service with a focus on addressing the resourcing pain points of the partner business model. With their new pivot, the company remains focused on partners and employee skills, but with a new goal – informing the broader landscape of buyers and service providers. The company is piloting its new search tool in the Netherlands. They have over a thousand Dutch IT services companies listed in their database, some with self-reported data (their paying customers) and others with publicly available data sources. Companies are profiled along dimensions including project experience (infrastructure, business applications, database, etc), industry focus, and product capabilities. The results are then displayed with Dynasource's own "Mondrian" charts, an visualization that resembles the Dutch artist's famous works. "We are trying to create transparency in skills and capabilities," said Dimitri Krabbenborg, business development manager at Dynasource. "If you are looking for a development firm, getting to a short list was quite hard. We believe there should be a tool to help make the decision, and by seeing the data you can be sure it's correct. LinkedIn or a company's website is not as accurate." The system is built with a bottom-up approach to data collection, Krabbenborg explained. Partners using the service ask employees to populate a profile describing their skills and expertise. That data is then aggregated to create the charts that show the overall services profile of a company. If an employee leaves, that person can take their individual profile with them and associate it with another employer. Individual workers' details are not exposed to the public.